The Football Association were today investigating whether Liverpool forward Ryan Babel would face disciplinary action following his criticism of referee Howard Webb on Twitter. 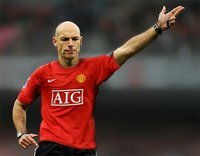 The Holland international used his Twitter account to post a mocked-up picture of the World Cup final referee wearing a Manchester United shirt following his side's 1-0 FA Cup third-round defeat at Old Trafford. The official awarded a controversial first-minute penalty to United after Daniel Agger was adjudged to have brought down Dimitar Berbatov and sent off Liverpool captain Steven Gerrard after diving into a tackle on Michael Carrick in the 31st minute.